Our facilities also have provision for carrying out Third party inspections to suit the requirements of the customers. Before the final product is released for shipping, it is also passed through all acceptance tests. Our technical know-how enables us to unearth growth with new applications and new customers. With the help of qualified and experienced engineers in production, sales and marketing, we are capable of designing, developing, and supplying correct solution to related applications. 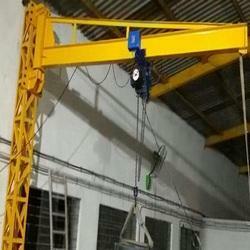 Our Jib Cranes are renowned for their qualitative parameters. We are a quality conscious company, introducing high-quality products new to the Indian markets which are acclaimed for their high utility and extreme effectiveness. 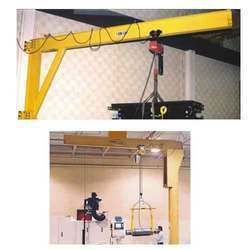 Our Pillar Mounting Jib Crane is known for their accurate and precise manufacture. The Venus Jib Cranes are built to consistently high specifications conforming to IS 807 and 3177 most Fabricated from Pipe/Rolled Steel Sections, M. S. Gusset plates / thick base plates giving added rigidity to a column. Base plates are drilled to take six/eight holding down bolts. The Jib arm fabricated from heavy section I beam for SMJC-1 and triangular truss construction or SMJC-2 & SMJC-3 type of jib cranes reduces deflection to acceptable limits. Bearings - Double roller self-aligned type bearings with thrust & roller bearings to take care of horizontal & vertical loadings as well as radial thrust. Swiveling - Through chain at the end of the jib arm and/or hand cranking for easy manual swivel, alternately electrically operated swiveling for SMJC-3 type jib crane, on request. For positive full rotation duly insulated brass swing springs with pantograph current collectors provided. This typology of crane represents the ideal solution for the material handling, in the working area of the crane arm, in a specific workplace. 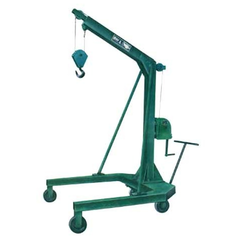 The jib crane for the industry is used to serve workplaces and handle materials with medium/low weight. The Bonfanti cranes are developed and produced in the respect of the ISO 9001 norms (TUV). We are counted as a leading name of the industry, specialize in manufacturing, supplying and exporting a client specific range of Floor Jib Cranes. Our experts pay utmost attention towards providing outstanding quality and desired product range in the market. We have state-of-the-art machinery, which make possible for us in manufacturing bulk range within the prescribed time period. We offer products in the market at reasonable prices. We are counted as a leading name of the industry, specialize in manufacturing, supplying and exporting a client specific range of Jib Cranes. Our experts pay utmost attention towards providing outstanding quality and desired product range in the market. We have state-of-the-art machinery, which make possible for us in manufacturing bulk range within the prescribed time period. We offer products in the market at reasonable prices. Being a leading name of the industry, we renowned for our ability of manufacturing, supplying and exporting a highly qualitative range of Wall Mounting Jib Crane. By using advanced techniques in our production procedure, we are been able to keep ourselves ahead of our close business competitors. We provide customization solutions, which are according to the specified demands of our valuable clientele. We offer products in the market at affordable prices. We are industry’s most reliable and economical source for qualitative products and thus been a known name for offering products. We provide a wide assortment of Manual Jib Crane which is manufactured by using premium raw material that is procured from quality driven industries.